It’s critical that you buy a yellow diamond from a vendor with high-quality photos like James Allen. Color can vary greatly even within a specific GIA color grade. In our experience, Leibish & Co. has the best prices and overall customer experience in the Fancy Color Diamond market. In addition, Leibish & Co’s expertise brings out the maximum color of a diamond when set in a ring. Yellow diamonds are very popular in halo settings like this stunning set but also go well with elegant solitaire settings like this one from Leibish. The unique color of yellow diamonds comes from the presence of nitrogen in their composition. The nitrogen molecules absorb blue light, making the stone a yellow shade. Depending on the amount of nitrogen, a yellow diamond could range from light to dark. As a part of the Fancy Color Diamond family, yellow diamonds may also have a secondary hue like orange or brown. Pure natural yellow diamonds of an intense shade are sometimes referred to as Canary Diamonds or Canary Yellow Diamonds. White diamonds are graded on a color scale of D to Z, with D being a colorless diamond and Z having a distinct yellow or brown tint. If the scale were to continue past Z—all the way to a rich, yellow color—you’d have a Fancy Vivid Yellow Diamond. In other words, yellow diamonds are fully saturated with yellow and carry no traces of whiteness whatsoever. Assessing the color of yellow diamonds—or any Fancy Color Diamonds—is a difficult task. Most importantly, each Fancy color grade isn’t simply a point along a line. Each grade is a range in itself. For example, it’s possible to find a Fancy Yellow that just barely made it over the border from Fancy Light territory. It’s also possible to find a Fancy Yellow that just missed the cutoff into the Fancy Intense grade. That’s why we recommend using a vendor like Leibish & Co. because they provide the highest quality of images—making it easier to determine which diamond is more beautiful and more valuable. Fancy yellow diamonds, also known as canary yellow diamonds, are relatively common. Due to their commonality—relative to other Fancy colors—yellow diamonds can be fairly affordable. Fancy Light Yellow diamonds, as an example, will price similarly to a I Color white diamond. For instance, this 1.01 Carats Fancy Light Yellow, VS2 Clarity Radiant Cut yellow diamond costs $4,150 while this 1.03 Carats, I Color, VS2 Clarity Radiant Cut diamond costs $4,100. At their strongest color intensity though, Fancy Vivid Yellow Diamonds can become rather expensive. A Fancy Vivid Yellow Diamond with a decent color and eye-clean clarity will cost approximately the same as a D Color Flawless white diamond of the same shape. At this point, it depends on which you and the wearer find more appealing: a unique, richly colored diamond or a white, colorless diamond. 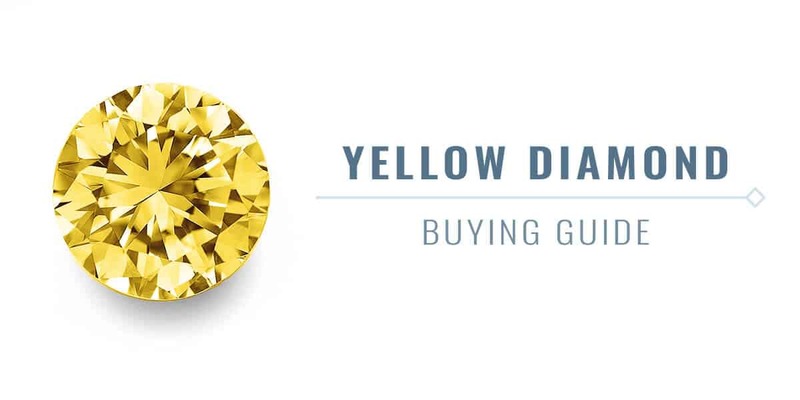 Evaluating the price of a yellow diamond is detailed, as even the smallest brown tint can reduce a yellow’s value, while green or orange tints will increase the value. For this reason, we recommend consulting an expert before moving ahead with a yellow diamond purchase. Setting a yellow diamond in an engagement ring allows for a unique opportunity to make the stone’s color even more intense. Most often, a yellow gold setting will make the diamond’s color appear deeper, while a white gold setting may make it appear lighter. In order to save on your budget, you may wish to look for a yellow diamond of one intensity grade lower and have it set in yellow gold to maximize the color. A halo setting can boost the size appearance of your yellow diamond engagement ring, especially if there are two layers of surrounding stones. Embedded side stones in a pavé setting give the ring additional sparkle. Your side stones can match the color of your center stone or be white diamonds. To accent and highlight your yellow diamond, consider a side stone setting. Your side stones can be round brilliants, triangle-shaped or any design that matches your style. Design jewelry for a gift that will be treasured for years to come. Yellow diamonds make for stunning jewelry—whether that’s a bracelet, necklace or set of earrings. Want to ensure you’re getting the best value and beauty for your budget? Contact our diamond experts today.